Last night’s win was one of those wins that felt like a loss. That ninth inning was such a near-catastrophe that it almost feels like the Yankees need to bounce back today despite picking up the W. That’s messed up, man. Wins aren’t supposed to feel like that. It’s a little cloudy tonight but otherwise it’s a nice night for baseball in the Bronx. Tonight’s game will start at 7:15pm ET and can be seen nationally on FOX. Enjoy the broadcast! Injury Updates: Jacoby Ellsbury (knee) did some more light baseball activities today, running sprints and playing catch, that sorta stuff. That was a really uneven seven-game trip to the West Coast. The Yankees played poorly in losing two of three to the Athletics then had basically the best series ever while sweeping the Mariners. They pounded Felix Hernandez in the first game, had a dramatic ninth inning comeback in the second game, and watched Masahiro Tanaka dominate in his return from the DL in the third game. How could it get any better? The weather is kinda crummy in New York. It’s been raining on and off all day, though there’s nothing more than some drizzle in the forecast tonight. That’s good. First pitch is scheduled for 7:05pm ET and you’ll be able to watch on YES locally and MLB Network nationally, depending where you live. Enjoy the game. Rotation Update: The Yankees are skipping Michael Pineda’s next start to control his workload. He isn’t hurt and will start next Friday. CC Sabathia will start on normal rest Sunday in Pineda’s place. The Yankees had an off-day yesterday and have off-days coming up on Monday and Thursday, so they can skip Pineda without needing a spot starter. Big Mike has already thrown 70.1 innings this year and is on pace for about 220 innings. He threw 76.1 innings last year and a career-high 171 innings back in 2011, before shoulder surgery. Injury Updates: Jacoby Ellsbury (knee) ran some sprints, took dry swings, and played catch today, the first time he’s performed any baseball activity since getting hurt … Ivan Nova (elbow) will make his first official minor league rehab start with High-A Tampa on Monday, the team announced. He is scheduled for 80-85 pitches and will make at least one more start after that before returning to the team … Carlos Beltran (foot) is still day-to-day after fouling that pitch off his foot in Seattle. He may be available to pinch-hit tonight … McCann (foot) got some new orthotics and tested his foot in the bullpen this afternoon. He’s fine and back in the lineup. The Yankees snapped their ugly six-game losing streak with a 14-1 blowout win over the best team in baseball yesterday afternoon. That was a game everyone needed. That sort of win is an anomaly though, especially against a club like the Royals. It’ll never be the norm. It’s starting to feel like summer around here. The temperate is again in the 80s today and there are only a few clouds in the sky. Nice night for baseball. Tonight’s game will begin just after 7pm ET and you can watch live on WPIX. Enjoy. Injury Update: Jacoby Ellsbury (knee) is still getting treatment and has not yet resumed any sort of baseball activity. “He’s walking around in a brace every day and doing treatment. We have not progressed past that yet,” said Joe Girardi to George King yesterday. All-Star Voting Update: MLB released the first AL All-Star Game voting update today and boy oh boy are Royals fans stuffing the ballot box. See it here. No Yankees lead at their positions but McCann (fourth), Teixeira (third), A-Rod (third) are among the top five at their respective positions. Ellsbury (7th), Gardner (11th), and Beltran (12th) are among the top 20 outfielders. A-Rod needs more support, folks. 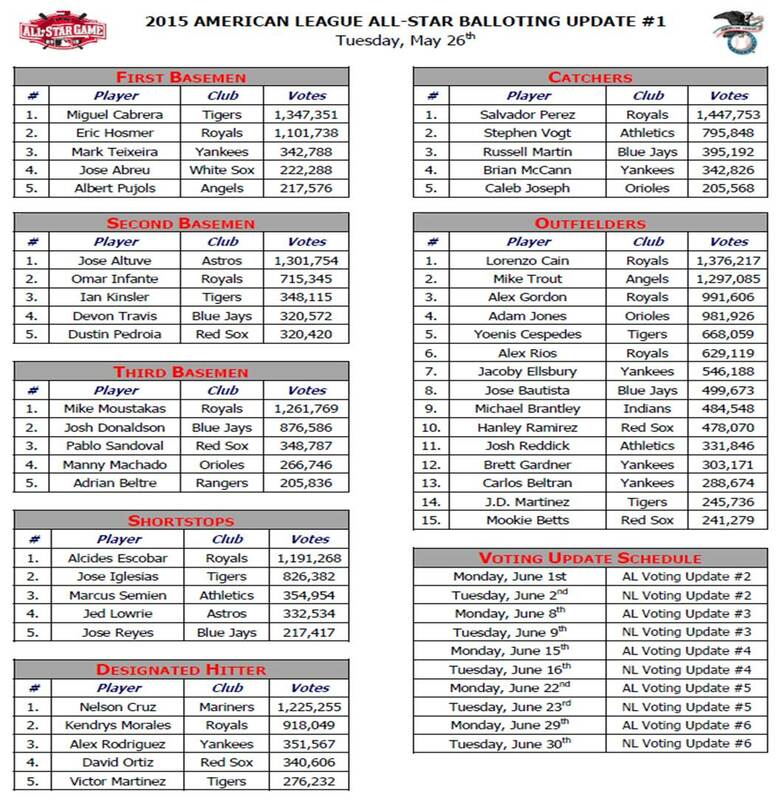 He’s nearly a million votes behind Nelson Cruz! Here’s the ballot. The last All-Star Game without a Yankee in the starting lineup was 1999, by the way. Start Times Updates: The Yankees announced their games on June 21st (Tigers), August 23rd (Indians), and September 27th (White Sox) will all start at 1:05pm ET. They had been listed at TBA. They’re all Sunday games, so ESPN didn’t flex them into the 8pm ET slot, basically. Hooray for that. Following last night’s game, Joe Girardi told reporters Jacoby Ellsbury is likely to miss more than the minimum 15-day DL stint due to his right knee sprain. Ellsbury suffered the injury when he caught a cleat on a swing and said the injury is on the outside of his knee. Girardi added surgery will not be required. That’s all we know at this point. Depending on the severity, a knee sprain could require anywhere from two weeks to two months to heal. Maybe longer. We’re just going to have to wait and see. Since Ellsbury is a speed player and this is a leg injury, the Yankees have to make sure he’s 100% before returning. I mean, that’s always true, but you catch my drift. Slade Heathcott figures to play quite a bit in Ellsbury’s absence, at least against righties with Chris Young playing against lefties. 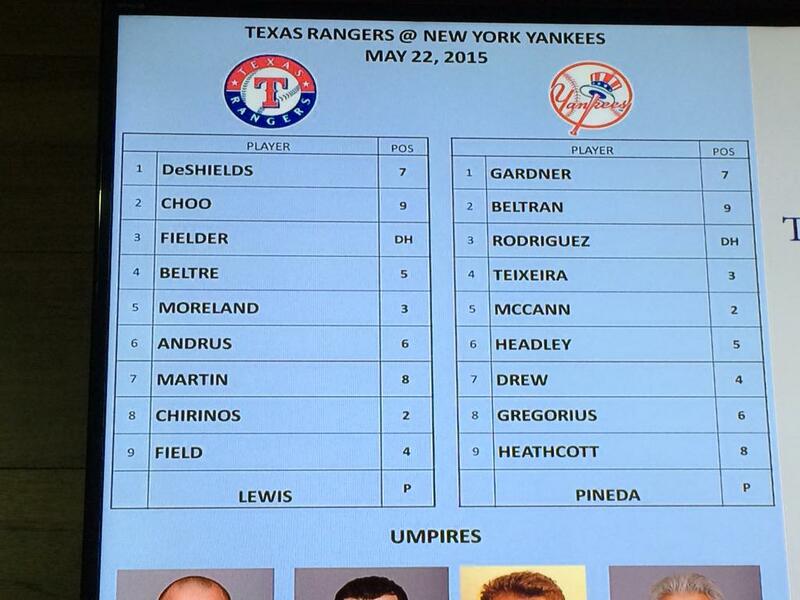 Brett Gardner has slid into the leadoff spot with Carlos Beltran taking over as the number two hitter. Problem is Stephen Drew and Didi Gregorius are batting seventh and eighth instead of eighth and ninth now, respectively. Ellsbury is the Yankees’ best all-around player and one of their best hitters, so losing him for any length of time is really bad. Even the minimum 15 days was going to be tough. I have no idea what Girardi means when he says Ellsbury will be out longer than that, but hopefully it’s not much longer. I’m as excited to see Heathcott as anyone, but geez, no Ellsbury is a huge blow. The Yankees are finally back home in the Bronx. They played 15 of their last 19 and 25 of their last 35 games on the road — not surprisingly, they’ve played the most road games in MLB — but are now home for a six-game homestand, which starts tonight against the Rangers. Nineteen of their next 31 games will be at Yankee Stadium. It was absolutely gorgeous in New York earlier today, but some clouds have rolled in and it’s pretty gloomy right. There’s a very tiny little bit of rain in the forecast but nothing that will impact the game. First pitch is set for 7:05pm ET and can be seen on YES locally and MLB Network nationally. Enjoy the game. Injury Updates: No timetable yet for Jacoby Ellsbury (knee), who will see the team doctor tonight … Masahiro Tanaka (wrist, forearm) will throw 65 pitches in his next Triple-A rehab start on Wednesday … Chris Martin (elbow) is playing catch and getting close to throwing off a mound … Gregorio Petit (hand) still is unable to swing a bat.